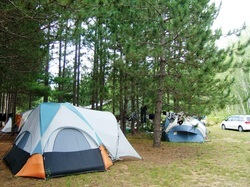 Tent camping $25 to $40/night, $125 to $200/week, tax included. Trailer sites: service 15A only + water add $5/night. Air conditioning or electric heat +$10/night. 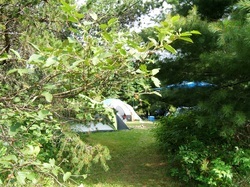 Site prices are based on 2 adults and their children under the age of 18, 1 vehicle, 1 camping unit. Pets allowed, $5/night in the campground. Group camping $20/adult/night, children free. Minimum 3 tent booking. 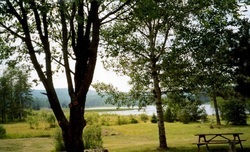 Group sites do not have electricity and water supply to the site. Prices subject to change without notice. Tax is included in all prices. Please contact for site availability and more information. To reserve a tent or trailer site, the first night is prepaid, nonrefundable by credit card or email money transfer. There are many abandoned sites on the internet. There is a lot of incorrect information on the internet. This is the only place to find current rate information for this premises. New to camping? 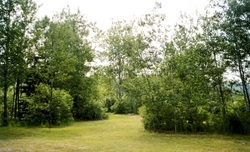 Here is a great page of do's and don'ts for campers in any park.